Today, May 21, 2018, marks the first celebration of the Feast of Blessed Virgin Mary, Mother of the Church, instituted early this year by Pope Francis. The announcement came in a decree issued March 3, 2018, by the Congregation for Divine Worship and the Discipline of the Sacraments. It was signed by its Prefect, Cardinal Robert Sarah. “The joyous veneration given to the Mother of God by the contemporary Church, in light of reflection on the mystery of Christ and on his nature, cannot ignore the figure of a woman (cf. Gal 4:4), the Virgin Mary, who is both the Mother of Christ and Mother of the Church.,” according to the decree. On March 27, 2018, the same Congregation clarified that the Memorial of the Blessed Virgin Mary, Mother of the Church, must be celebrated by everyone, beginning this year. The “Notification” from the Church’s Congregation for Divine Worship and the Discipline of the Sacraments clarified that the new Obligatory Memorial of the Blessed Virgin Mary, Mother of the Church, must be celebrated in the Ordinary form of the Roman Rite beginning in 2018. The new feast is to be observed on the Monday following Pentecost. Because Pentecost is a movable feast, tied to the celebration of Easter, it is possible that the new Memorial could coincide with another Memorial of a Saint or Blessed; and when this happens, the feast of Mary, Mother of the Church, will take precedence. 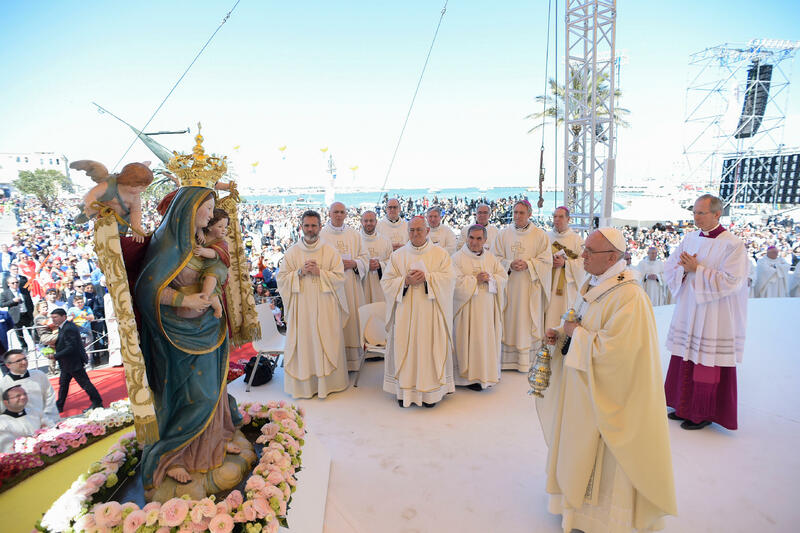 The new feast was inserted into the Universal Calendar for the Latin Church earlier this year by Pope Francis, in a decree dated February 11, 2018 – the 160th anniversary of the apparition of Mary at Lourdes. Previously, permission to celebrate a feast of Mary had been extended to Poland and Argentina, as well as St Peter’s Basilica, and several Religious Orders and Congregations. The title of “Mother of the Church” was famously bestowed on the Blessed Virgin Mary by Blessed Pope Paul VI during the Second Vatican Council. The understanding of Mary’s motherhood has developed in the decades following Vatican II, especially as the Church has reflected on the Council’s teaching about Mary in chapter 8 of the Dogmatic Constitution on the Church (Lumen Gentium). Following the inscription of the Obligatory Memorial of the Blessed Virgin Mary, Mother of the Church into the Roman Calendar, which must already be celebrated by everyone this year on the Monday after Pentecost, it seemed opportune to offer the following directions. The rubric found in the Roman Missal after the formularies for the Mass of Pentecost, “Where the Monday or Tuesday after Pentecost are days on which the faithful are obliged or accustomed to attend Mass, the Mass of Pentecost Sunday may be repeated, or a Mass of the Holy Spirit, may be said” (Missale Romanum, p. 448), is still valid because it does not derogate precedence between liturgical days whose celebration are solely regulated by the Table of Liturgical Days (cf. Universal Norms on the Liturgical Year and the Calendar, n. 59). Likewise, precedence is regulated by the norms on Votive Masses: “Votive Masses are in principle forbidden on the days on which there occurs an Obligatory Memorial, on a weekday of Advent up to and including 16 December, on a weekday of Christmas Time from 2 January, or on a weekday of Easter Time after the Octave of Easter. However, for pastoral reasons, as determined by the rector of the church or the Priest Celebrant himself, an appropriately corresponding Votive Mass may be used in a celebration of Mass with the people” (Missale Romanum, p.1156; cf. General Instruction of the Roman Missal, n. 376). Nevertheless, all else being equal, the Obligatory Memorial of the Blessed Virgin Mary, Mother of the Church is to be preferred. The texts of the Memorial were attached to the Decree along with indications for the readings, which are to be held as proper because they illuminate the mystery of Spiritual Motherhood. In a future edition of the Ordo lectionum Missæ the rubric at n. 572 bis will expressly indicate that the readings are proper and, even though it is a Memorial, are to be adopted in place of the readings of the day, (cf. Lectionary, General Introduction, n. 83). In the case where this Memorial coincides with another Memorial, the principles of the Universal Norms on the Liturgical Year and Calendar are to be followed (cf. Table of Liturgical Days, n. 60). Given that the Memorial of the Blessed Virgin Mary, Mother of the Church is linked to Pentecost, as the Memorial of the Immaculate Heart of the Blessed Virgin Mary is similarly linked to the celebration of the Most Sacred Heart of Jesus, then, in the case where it coincides with another Memorial of a Saint or Blessed, and following the liturgical tradition of pre-eminence amongst persons, the Memorial of the Blessed Virgin Mary is to prevail. From the Congregation for Divine Worship and the Discipline of the Sacraments, 24 March 2018.